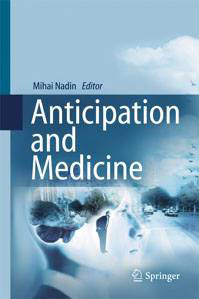 Anticipation in Knowledge Media Design, Knowledge Media Design (P. Stefan, Ed.). Berlin: Oldenburg Verlag, 2005, pp. 75-94; Second edition, 2006, pp. 71-90. Against the background of ubiquitous computation, new fields of human activity are continuously being established. Knowledge Media Design (KMD for short) is one from among those fields. It is probably more relevant than most due to its focus on knowledge. To experience the never-ending diversification of human activity is challenging and rewarding, as well as exciting. Nevertheless, each time a new field is declared, we are inclined to stop and answer the cliché question “What’s new?” Experience shows that many times much of what is, at a given moment, pursued as new, or even as a major breakthrough, is no more than what we already know and have practiced under different labels. Take wireless telephony as an example. Yes, once upon a time—and even today, in some places—isolated on hills, or from towers in their towns, watchmen signaled to each other using fire, smoke, or noise: no data, only meaning (Danger!). True, no one will claim that the limited communication of the past is the precursor of wireless telephony on the mere ground that fire and noise do not require wires as conduits. And we know that wireless telephony is only a modest part of what wireless networks allow us to accomplish in terms of data integration and rich human interaction. To give another example: Teachers structured their classes and used illustrative means (drawings and photographs, preserved stuffed animals, dissections, rudimentary experiments, etc.) before anyone could have guessed that one day computation would replace written natural language as the underlying structure of human activity. This applies to teaching, learning, and training as well as to communications, entertainment, manufacturing, and market transactions, to name only four areas of human activity. Still, KMD is not what teachers in the not too distant past practiced in order to enhance the education experience and to make learning more attractive and effective. In both cases (wireless communication and KMD), but more so in KMD, designers and users deal with a fundamental change. Indeed, what defines the plethora of new human activities emerging in the age of computation is the totally new way of conceiving and carrying out tasks. We are part of a new pragmatic framework. This means that a never-before experienced set of requirements and expectations lead to the self-constitution of human beings who, while apparently not different from their predecessors (almost the same anatomy, slight physiological differences), are engaged in activities fundamentally different from all those practiced in the past. Although people living and working today have much in common with people living in previous ages, the condition of today’s human being—especially the cognitive component—is not reducible to that of preceding generations. Let me explain. Pragmatics is a word that encompasses how we become what we are through what we do, through our activities. The means involved—language, tools, or media—are not neutral; they exert a formative influence. This is a decisive aspect to which I shall return more than once. Thinking in language, for example, is not the same as thinking in images. Operating a machine according to a certain procedure is not the same as choosing an operation from a menu that prompts the next step. KMD is a new practical experience impossible to reduce to previous experiences, even though it does not necessarily exclude those experiences. On the contrary, given its ever-expanding means, KMD is a synthesis based on the revolutionary change brought about by computation. It not only benefits from computation, it also affects the new forms through which computation enters our lives. And it affects computation as well. But again, what is KMD? First of all, KMD is different things to different people. One company, conveniently called KMD , offers professional Website design and development. Another one  builds upon the peer-to-peer (P2P) model, a decentralized form of networking that enables the one-to-one model of communication that helps individuals swap data (from music files to animation or research resources). Yet others see it as the answer to each and every form of education and training in our age. There is a common denominator to all these different views, but not common enough to make us understand what the new human experience of KMD really means. In order to understand the premises and pitfalls of defining a new field, we need to clarify our terms. With the understanding of what it means when we label some activity by using particular words, we can see whether the name suggests an opening or a dead end. This is my subject here: the viability of KMD, not of operations and enterprises such as the ones mentioned above. Is it a new hype, with many promises and few accomplishments? Or is it a deep and wide-reaching new practical experience? As I write these lines, there are almost 500 dedicated programs, in various universities and colleges, at undergraduate, graduate, and even doctoral levels, around the world. Almost all programs in KMD feel that they have to provide some introduction to the field. (Otherwise, how would they sell the attraction of KMD?) They start by looking for the definition of the three nouns used: knowledge, media, design. Like all etymological exercises, this one is interesting, but it misses the point. By referring to definitions given in dictionaries and other sources, one actually refers to the pragmatics of the past. What made KMD possible is a new pragmatic framework. What makes KMD relevant is the opening of new pragmatic dimensions that transcend the field itself. These new dimensions affect the human being’s condition and the nature of human existence. The political clang of the formula “We live in a knowledge economy” does not do justice to what is expressed here. “Nothing new,” some will say again. Humans needed knowledge to hunt, to gather fruits, nuts, and grains; they needed more knowledge in order to make tools, to farm; and even more knowledge to make and use machines. So what’s the big deal over the knowledge humans need today in order to carry out their tasks? The knowledge of the past was present in the pragmatics of human existence as a requirement related to performance. Guided by this knowledge (sometimes rudimentary, other times quite sophisticated), people carried out tasks related to survival and to progress. Knowledge is the object of experience; it is the object of human actions, and it is often the end: the product, the result. In the past, knowledge corresponded to a relatively stable world and expressed an expectation of permanency—the quest for eternal truth, whether religious or scientific in nature. Today, knowledge is only a measure of change; and as such, it contributes to faster cycles of innovation. It sounds like a paradox: Knowledge makes knowledge obsolete. But that is how knowledge came into existence. That is how knowledge is ultimately validated. Behind each negation of knowledge remains the force of questioning as an underlying factor of the dynamics of human existence—not the illusory hope of eternal knowledge that characterized both religion and science in the past. I do not intend to revisit my broader elaborations on the subject (Nadin 1997, 1999, 2003), but rather to focus tightly on the characteristics of KMD, in particular on the anticipatory dimension of this new human experience. The definitions given to knowledge—such as “truth, facts, or principles” (Baecker 1997, Perkins 1986)—media—“enveloping substance . . . through which impressions are conveyed to senses” (cf. Oxford English Dictionary)—and design—“to form a plan” (cf. Oxford English Dictionary) have in common a reductionist-deterministic foundation. This foundation corresponds to an explanation of everything as nothing more than the cause-and-effect sequence—one thing, the cause, determines the other, the effect—and the associated method of reducing complexity—reduce the whole to its parts and gain understanding of the whole by understanding one or more of its parts. Everyone in the Western world has been educated in the spirit of this explanatory model; the rest of the world adopted it, too. There is little to reproach but for the fact that it proves incomplete, at best, in a broader perspective of our universe of existence. The world that this model describes, quite successfully, is that of physics: all matter and its infinite array of expression as elements, states, and change. Based on this explanation, humankind leaped from being part of the world into assuming the role of shaping it. If we take the religious foundation of the human being as a reference (literary or literally, depending on where one places himself in respect to the subject)—“Be like me” is what Divinity asks of the human being—we find in determinism the serious acceptance of the invitation to partake in “making the world.” Alternatively, science starts from the need to know in order to change what is not yet agreeable to the human being. The new endeavors that humankind is engaged in—exploring the submolecular and subatomic levels of matter, as well as the extraterrestrial—are indicative of the effort. They continue the acts of controlling nature and opposing it to “human nature.” The “patron saints” of all these spectacular attempts are Newton, Descartes, and all their followers, including many scientists currently active in physics, chemistry, computer science, and the ever growing number of fields of inquiry resulting from progressive specialization. Now that I have acknowledged the “saints” and “church” of determinism and reductionist thought, it is time to challenge these perspectives by pointing out that the extremely effective description of physical phenomena that they gave is far from being adequate for dealing with the living. The current scientific focus on the living—biology at the DNA level, molecular biology, bioengineering, etc.—although still predominated by the deterministic-reductionist model, is indicative of the fact that further advances in science will more likely result from examination of what does not fit the model. The deterministic model is one of reaction (Actio est reactio, as Newton, 1687, claimed); the complementary model is that of anticipation. From the reactive model, we inherited the broadly accepted viewpoint that the living is reducible to a machine. And since the living, like everything else in our universe of existence, is a physical entity, its dynamics can be represented through the functioning of a machine. The difficulty starts as we notice that the living is indeed a physical entity with a plus. This plus dimension was eliminated (or at least left out) as science tried hard to get rid of the animistic dimension (from anima, the soul or spirit, that which, in opinions prevailing in the past, moves a physical entity, gives it life). The best description science could come up with some 400 years ago to oppose the animistic viewpoint is expressed in the reductionist-deterministic model. But today, we are much farther ahead, in time as well in our understanding of science. And we are much better prepared to handle complexity, instead of explaining it away. 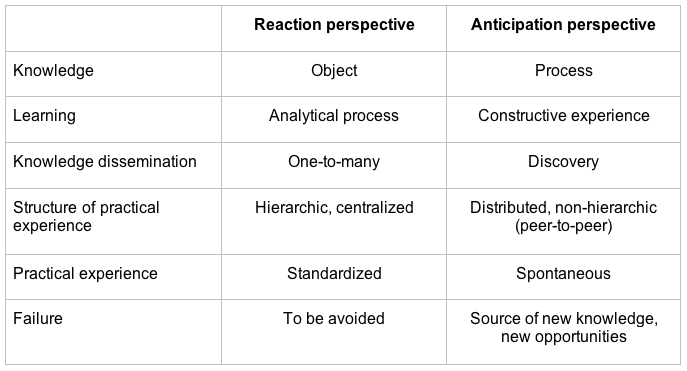 Without entering into the details of a scientific foundation of anticipation (Nadin 1999, 2003), let us present here a short framework of understanding. In the deterministic view, the past defines the present and future. In an anticipatory perspective, this is not negated, but complemented by accounting for the action from the future to the present: “Die Ursache liegt in der Zukunft” (The cause lies in the future). Here is a diagram explaining what is meant and how von Foerster’s (1999) sentence can and should be interpreted. Fig. 1. The cause lies in the future. This information can be expressed in bits. Today’s wireless application is based on information theory and is deterministic in nature. 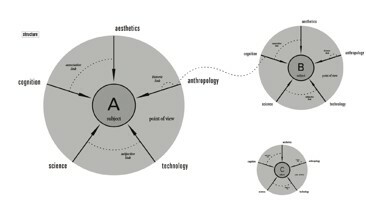 But it opens an anticipatory dimension because it integrates the living (usually called user) and the physical system. In other words, it is a hybrid entity. In the physical, systems tend towards higher entropy. (The laws of thermodynamics express this in precise terms.) In the living, the negentropic (the negation of entropy), the design, the giving shape and form, the realization of identity opposes the physical disorder. Indeed, the opposing tendencies are expressed when the human being makes KMD the result of integrating the physical and the living, integrating reaction and anticipation. Those who conceive KMD only from a deterministic perspective are animated by the thought that at the end of the exercise, there is a machine they can conceive of that will perform knowledge media design. Such a machine will take the ingredients, mix them according to some formula, and generate a valid learning environment as output. What they do not realize is that if such a machine were possible, it would ultimately be deployed to teach machines, but it would not be part of the human experience of learning. Let us now deal with the specific anticipation aspects of the living components of KMD, i.e., knowledge and design. As a matter of principle, we do not consider the reactive and the anticipatory as mutually exclusive, rather as complementary. The deterministic-reductionist view is that knowledge can be seen as a result of some human experience; that is, the expression of the past as it determines the present and future. It takes the form of descriptions, laws, principles; and it is subject to measurement, it is quantifiable. We realize that this is not a unanimously held definition, but it proves to be an operational instrument most of the time. It is used when it makes sense, and even when it does not. From the intrauterine phase of an individual’s life to the so-called “golden age,” someone or some groups will define what knowledge can be imparted: provide the right type of music to the fetus; give the newborn and toddler ”educational” toys; give kindergarten children the occasion to prepare for college or for professional life—cause and effect in pure form, guided by the love that parents have for their offspring, and by the way parents themselves were “broken in.” “How do you drive a new car so that it will “learn” your habits and not break down too soon?”—is the mechanical model behind the action described. What kindergarten, schools, colleges, training facilities, life-long learning providers do not realize is that, together with learning all that has been accumulated from the past—the knowledge from any “how-to” book, be it how to write, spell, sing, dress, ski, dance, behave at the table, add numbers, write programs, play tennis, sequence a DNA sample, you name it—the living always learns what does not yet exist, what will be, that is, the future—before the future happens. In the container model of the education practiced in the Industrial Age, someone—teacher, advisor, professor, coach—mixes and dispenses the “right” amount of knowledge accumulated from the past. This is the input. The children (or whoever receives this so-called knowledge) take it in, process it in some way, and VoilÃ , they should be able to read, write, do math, play an instrument, or look through a microscope and see what the professor wants them to see. But this is not how the living, human or not, operates. Living means to express one’s identity through action. The human being becomes what he or she is through doing, not through processing knowledge dispensed by others. Machines can be taught, and are effectively taught, how to carry out certain operations. Human beings are in anticipation of such operations. Hammering takes place first of all in the mind. With all knowledge of hammering disbursed to an apprentice, we only train a human being expected to act like a machine. Anticipation puts knowledge in context: You do not nail into water—a machine does not know this—or into a block of steel. You nail as the experience of self-constitution makes it possible and, under certain circumstances, necessary. Charlie Chaplin’s  genius in Modern Times expressed this idea so much more convincingly than my words here. Fig. 2. 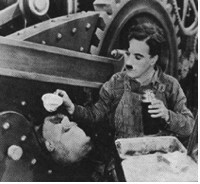 The Tramp feeds a co-worker caught in the wheels of a machine. Knowledge in the deterministic-reductionist perspective can be extremely sophisticated. Just think about automation in its enormous variety. It applies very well to homogenous situations, to repetitious patterns. That kind of knowledge can be “canned”—and artificial intelligence claimed knowledge-based systems as some of its major successes. Training and learning by rote are “can-able.” This is why so many companies are selling “Training” as a product. Knowledge from an anticipatory perspective is actually process. From this perspective, to learn is not to be fed knowledge, but to be in the condition to construct it, to discover, as you go along, what else is necessary in view of the goal pursued. Allow me to present a summary of how acknowledgment of the anticipatory nature of knowledge prompts the fundamentally new condition of human activity. Economies used to base their development on raw materials, energy, and capital as wealth emerged as a sublimation (in the chemical sense of sublimation) of human activity. Knowledge is the complementary asset, and its importance will overtake that of the old sources of wealth. A knowledge economy is one in which reaction and anticipation are pursued in tandem. In such a context, learning, as a knowledge-related activity, is no longer reducible to recording or acquiring knowledge, but to constitute it in learning experiences. What we know affects how we construct new knowledge; that is, what we know affects what we do. The contextual nature of knowledge explains why some knowledge is, within a particular experience, more meaningful than another. Knowledge is distributed; the hierarchic and centralized model of knowledge is replaced by the distributed model. Therefore, to approach knowledge media from an anticipatory perspective means to focus on integration of knowledge, integration of human beings, and on the reality of the fact that human beings are infinitely different, and therefore difficult to bring together. The model of a homogenous society made up of similar individuals corresponds to the machine model. Hitler practiced it; Utopian models are based on it; the new fanaticism of our age requires it. Acknowledging differences—because difference is the source of dynamics—corresponds to the anticipatory description. Motivational aspects are anticipatory in nature. But within a mechanical model, motivation is often understood only as a behaviorist aspect (the required model as a cause-and-effect mechanism). The chart contrasts the reactive and anticipatory modes. This is not, by any means, a complete image of what the new context means; but it gives those individuals involved in KMD a framework for defining their specific role. The definitions of knowledge that resulted within a deterministic-reductionist view of the world could not escape the limitations intrinsic in this view. In contrast, the definitions of design have always made clear that there is an opening towards a direction that involves the future. Indeed, we can never redesign the past; we can, at most, reinterpret it. Moreover, in every definition of design, there is the element called creation, i.e., to make something that did not exist before. Machines are repetitive; they can make the same thing again and again. Cause-and-effect implies the expectation of uniformity and homogeneity. Machines embody it. Design is the new take on whatever the subject of a given design experience is. It has been said, over and over, that design is ubiquitous. It is part of everything we do: the way we present ourselves (clean, dress according to a particular style, etc. ); speak, move, arrange our universe (flowers in a garden or vase, stickers in an album, papers on a desk, etc.). Through design, we say something about how we like things to be, how we like to project our identity. This applies just as much to children as they order pebbles on the beach, and to mothers as they provide a proper environment for their children, to runners as they care for their physical condition, to professional designers—architects, media consultants, event designers, people who lay out newspaper pages, designers of new genes and new materials, for example. There is no human-made entity that does not have a design component to it. As encompassing as design is, in discussing the anticipatory dimension of KMD, we cannot ignore the fact that design is not in reaction to something, but in anticipation—of pleasure, harmony, satisfaction, usefulness, or whatever else a design might accomplish. Although a new design negates a previous design (the reactive component), it is in the end legitimized through the new, the anticipation. Surprisingly, the dominant view of design is deeply anchored in the deterministic-reductionist view of the world: design as problem-solving. At its best, this description is confusing. (I would prefer to say “idiotic,” but so many great names are attached to this ill-conceived formula that one ends up more iconoclastic than constructive in describing the formula for what it is.) It says that there are problems out there in the real world, and all it takes is for a designer to be asked to fix them. Once this is done, we all live happily ever after. If this were so, invention, which is part of the practical experience of design, would not come about. Problems, or breakdowns, in the mechanical model of the world are well defined. A water pipe bursts, the plumber will repair it. Machines operate according to this simple description. Problem-solving in this context makes sense and is one of the accomplishments upon which the society of the Industrial Age was predicated. Within the problem-solving paradigm, one needs the knowledge related to the problem. It is like the functioning of an engine for which one needs gasoline or electricity. In design, knowledge is generated, while previous knowledge is either integrated or discarded—because it stands in the way or blocks new avenues. Accordingly, design is actually complementary to problem-solving, but not reducible to it. This complementary dimension is the generation, the creation, of new ideas, artifacts, actions, or processes. The separation of analysis, which qualifies as a possible premise for design, from synthesis, without which there is no design, led many to believe that a good theory of design can do justice to what design is by explaining what design was: teach design by example. Design is not independent of the medium/media in which it is expressed. The integration of computers in design processes might facilitate the automation of many tasks, but not of design itself. The new is an expression of an anticipation. It can go wrong (the most recent example is the Air France terminal at Charles de Gaulle Airport in Paris/Roissy ), but it can, as well, open new avenues for the unfolding of the human being. To understand design, one needs to be subject to it, to experience it (a concert in Los Angeles County’s new Walt Disney Concert Hall , designed by Frank Gehry, is not describable in words), or integrated in a communication experience. From the many aspects of design related to KMD, I shall mention only the notion of participation. Designers engage those involved in a KMD situation by making co-design, i.e., interaction, possible. A shared context of knowledge guides anticipation in the design and in the experience of knowledge experience. This is why to talk about design in KMD is to refer to the need to —design the design process,— that is, to realize that it is not design that is mediated through KMD, but the constitution of knowledge. In order to again facilitate some understanding of what anticipation-guided design is able to provide, I suggest a short-hand contrast scheme. But we can, and should, consider yet another aspect. Within the deterministic-reductionist model, design became a specialized activity. The profession designer was eventually accepted. (So were many other professions defined along the line of a particular cause-and-effect sequence: medicine for causalities pertinent to health, with the physician as engineer of the human being understood as “machine;” pharmacy for causalities pertinent to healing (or at least the appearance thereof), with the pharmacist as the “chemist” of the “biological” machine; education for causalities pertinent to teaching and learning, with the teacher or professor as the source of knowledge to be dispensed by the “machine” called school or university, etc., etc.) The realization that complexity cannot be discarded, but rather ought to be integrated in our practical experiences, makes the next steps necessary. Combine specialized knowledge (leading to expertise in a limited experience) with the knowledge of those persons involved in new experiences. Make possible the interaction of minds, instead of the narrow taming of minds; instead of the reduction of heterogeneity (variety) to homogeneity (the “right” solution eliminates all other possibilities), allow for the multiplication of options. Although we still practice the inappropriate distinction designer-user, we come more and more to the realization that users need to be engaged. They need to be empowered in order to produce alternatives corresponding to the fact that no two users can be the same. I do not suggest here the adoption of the cheap talk and demagoguery of the politically correct: “Understand users’ need.” In reality, there is no way to achieve this. This formula eventually leads to the absurd measurement of design adequacy based on the model of usability (cf. Nielsen 2000 and Norman 2002, the unperturbable champions of a mechanistic view of design applied to user interfaces). This model reduces the infinite diversity of individuals to some averaging formula, and concludes that the “machine-like” performance of users forced to give up individuality is a good measure of the software performance. My focus is on forms of engaging all those who become part of the experience. No doubt, professional designers, in the meanwhile specialized to a degree that defines the encompassing notion of design, share experiences that resulted from their particular involvement in creating new entities. There are technical aspects (the “how to” of the profession), as there are a conceptual framework and organizational principles that can be shared. In addition, the professional designer can (or should be able) to express what many people imagine—How should something look? What should it accomplish? How should it feel?—that is, qualitative aspects. For this, the professional designer is competent in the visual, or at least realizes that the visual carries design much better than words do. The community of professional designers (PD) might regard those for whom they design as unqualified for being engaged. This reflects the cause-and-effect based reality of top-down, from designer to user, mentality. It also explains the impertinence of the distinction: the designers look down on what they call users. If all works right, the design is good. If it does not, the user is considered incapable of realizing the value of the design. Or the designer has to address the phantom average user and allow him or her to perform like a machine. But the complementary entity to PD can no longer be ignored. Creativity relies on complexity. It does not emerge as complexity is ignored, especially through so-called simple solutions (promoted by Krug, 2000, for example). Design Addressees (DA) are those who realize the need for design, as well as the specific nature of design for their own practical experiences. The physician who integrates visualization techniques (such as advanced functional magneto-resonance imaging, i.e. fMRI) in his profession is such a DA; the pharmacist who understands virtual reality methods for “making” new, individualized substances, corresponding to each person, is also such a DA; and so are teachers and professors who no longer put their stereotype classes on the Web (old content carried by a new medium), but individualize their activity so as to address each student according to his/her characteristics. To finish here: Only by engaging the PD and the DA can we reach a form of design that will make possible the new practical experiences of this age. KMD is by necessity an engaging form of design; and it is driven by anticipation. That engagement, as I suggested above, is not an easy task need not be belabored. An asymmetry of competence between PD and DA renders the act of engaging dramatic. We cannot ignore it, but neither can we afford giving it up only because it is difficult. We know by now that the list can be only partial; some media disappear, new ones appear. Essentially, they are the matter in which information that makes human interaction possible is embodied; they are not just conduits (channels), as some think. As physical entities, media are subject to all that pertains to the physical understanding of causality. From the perspective of anticipation, media cannot be conceived as “containers” or even “pipes.” Media rather embody, i.e., materialize, the expression. To express means to bring out to one’s own awareness or attention, or to that of others, to externalize what otherwise might be part of the dynamics of the living. The act of expressing is not independent of the medium of expression. This is especially relevant in the expression of knowledge: an equation, as an expression in the medium of mathematical formalism is much different from a visualization. 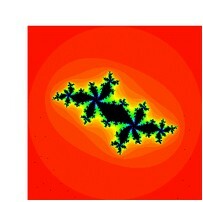 The concise mathematical expression in which the fractal dimension is implicit becomes a totally different thing once we look at images that make the self-similarity clear. 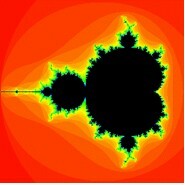 The precise definition is: The Mandelbrot set M consists of all of those (complex) c-values for which the corresponding orbit of 0 under x2 + c does not escape to infinity. Fig. 5. Mathematical formalism and expression through images. For the filled Julia sets, we fix a c-value and then consider the fate of all possible seeds for that fixed value of c. Those seeds whose orbits do not escape form the filled Julia set of x2 + c.
To make possible the dynamics of anticipation, media need to be conceived, designed, and realized as interactive. This means that they need to allow for the active influence of those who express themselves in one medium or another, but also the practical experiences of modeling, simulation, and redesigning pertinent to teaching and learning. KMD cannot passively deal with media; it has to be involved in conceiving media, as it has to develop means and methods for evaluating the appropriateness of media. The notion of appropriateness implies interactivity. At the time when I challenged McLuhan’s successful formula “The medium is the message,” my position was rather isolated. In the meanwhile, some media professionals joined me in this conclusion—Nicholas Negroponte is only one among them—noticing that a computational model of weather contains many possible realizations: as a voice message (“Tornado watch”), as a diagram, as an animation, etc. In other words, the message is the medium/media, as I claimed, as it is instantiated in a given context, in one or another form of expression: The weatherperson on television is but a “medium” for the common underlying computational model from which others derive “media” such as “warnings,” “watches,” SMS weather products (for your cellular phone), and many more. The meteorological knowledge driving the choice of media and the learning experience is of extreme complexity. The dissemination of knowledge can take quite a number of specific forms, as the practical context requires (What do we do with the knowledge?). By way of a concrete KMD development (through a project in the area of digital dissemination of knowledge), I would like to make all these theoretical principles a bit more concrete. 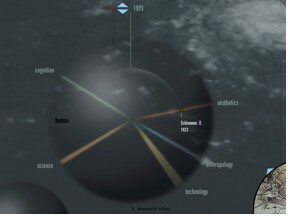 An interactive application will illustrate the anticipatory perspective. One way to represent knowledge is to see it as an infinite sequence of associations. Such associations can exist between what we know and what we are in the process of acquiring as knowledge, or between some related or apparently unrelated entities. Associations are cognitive processes supporting knowledge acquisition, as well as knowledge dissemination. How associations come into being is difficult to describe. One short explanation would be that we receive information from the outside world (the reaction aspect), but we also generate information (the anticipation aspect). Associations that have taken place can be documented, refined, or, if some turn out to be irrelevant, discarded. Associations are almost always multimedial, i.e., we associate texts, sounds, pictures, motion, etc. This characteristic of associations is especially relevant to KMD. serve as part of new practical experiences, as opposed to being merely a container of knowledge. Accordingly, we proceeded by defining a new structure. The structure of an interactive, multimedia encyclopedia based on associations includes a knowledge space/domain; an associative search procedure; and a function for storing and refreshing associative traces. 4.1. Proactive multimedia navigation. Interactivity. Until now, problems of navigation in multimedia have in the main been reduced to the research of interface. Aspects of metaphor constitution, of the role of visual language, of the understanding of feedback mechanisms, as well as of the role of back channels, were pushed into the background. Therefore, we proceeded with a powerful metaphor: knowledge as a sphere whose dimensions change as knowledge advances. The less one knows, the less the surface between the known and the unknown; that is, the less the awareness of one’s own ignorance. Various spheres result from various fields of interest. For example: to know chemistry involves a knowledge of physics, of symbolism, of dynamics (how things change). Each sphere of knowledge is variable. And each type of knowledge can be considered from various perspectives. In cooking, chemistry is only indirectly significant. In creating a new substance, the taste of the elements is not the most important aspect. Moreover, questions pertinent to knowledge acquisition, expression, understanding, and application must also be taken into consideration. Consequently, we realized several things. 1) In some knowledge dissemination situations, we can assume homogenous sets of data. For example, plumbers, who have to make house calls, know that they will usually encounter a relatively standard situation, which can be easily translated into a training program. Associations are kept at a minimum. What counts is the rapid diagnostic and the remedy. Shared experiences of this kind of knowledge require little interactivity. 2) In other situations, data change continuously. There are several types off expression. New experiences affect what was expressed as knowledge. This is the rule in the medical fields. Moreover, a plumber will rarely have to ask a colleague for advice; physicians quite often rely on advice from colleagues. In this situation, associations are open, and media expression (e.g., fMRI images, an electrocardiogram, blood pressure measurement) is extremely varied. 3) There are also open systems of knowledge that allow for continuous generation of new hypotheses, tests, experiments, confirmations and invalidations. For such an open-ended encyclopedia representation, the generalized medium of networks (integrating wired, wireless, digital, analog, etc.) is probably the next best metaphor. The sphere of knowledge becomes a node in the network, and every change is propagated and weighted against previous explanations. Although the community of scientists dedicated to the design and implementation of distributed collaborative learning systems is aware that the real potential of the digital dissemination of knowledge lies in media integration, very little has been done to specifically deal with the integration of image (produced as computer graphics, photographs, film, animations, videos), text, audio, and other media. Even less has been done in developing navigation concepts, methods, and instruments appropriate to this complex task. Until now, navigation has been predominantly considered independent of forms and means of representation. Representation, however, is a constitutive dimension of gnoseological activity, not just a theme of formal description and focus. Accordingly, those involved in the cognitive aspects of learning realized that it is essential to conceive, design, and optimize navigation tools in respect to representation models, and not only to what is still naively defined as content. Various possibilities and restrictions are intrinsic to a chosen representational mode—assuming that the requirement of adequacy is effectively met. It is not the same thing when navigation takes place in a 3-dimensional space as when it takes place in 2-dimensional text display. We can read of molecular docking, or we can experience it. But the two—reading vs. Experiencing—are by far not equivalent. The representation chosen (text description, graphical illustration, or virtual reality context) affects to a high degree the nature and the outcome of the learning experience. Texts can be disseminated in various forms (from e-mail to scholarly publications). Graphic representations can range from simple diagrams to animated sequences. However, these forms are interactive in a limited sense only. They can be integrated in Web interactions, but not in cooperative forms of learning. A virtual reality environment can be distributed and accessed from many parts of the world, and experienced in a cooperative effort. In recent times, with the emergence of channels and active desktops, the dynamic characteristics of navigation tools have again changed. We know “pull” methods (learner finds a site and pulls a subject in some format varying between a PS or pdf download of text to a chat room), as well as “push” methods. These apply to “subscriptions” made in the network by those pursuing a specific course of learning. In both cases—push and pull—the subject of navigation must reflect the need for customization (learning is an individual experience regardless of where and when it takes place). mechanisms for updating both the body of knowledge represented through interactive multimedia methods and the appropriate navigation tools. the anticipatory nature of the mind. This approach suggests the following data-mining procedure: the constitution of associative links and the automatic generation of associative maps corresponding to different types of learning and investigation. In order to accomplish this goal, we suggest a multimedia database with powerful indexing and classification functions, eventually with resident intelligent procedures. This database is complemented by an intelligent search procedure able to handle multimedia representations of knowledge. The underlying information is provided with a gnoseological map of known interpretations, as well as with an indexing utility in which the learner or researcher advances new hypotheses or new interpretations as these arise through the continuous progress of knowledge acquisition and discovery. In developing the navigational tools, we addressed the constitutive elements of the mind-ergonomic structure. Specifically, this refers to the variety of cognitive types of learners, exemplified, for instance, in question formulation through text queries or through visual or aural queries. Answers, although independent of these cognitive types, are made available in a variety of formats corresponding to those types. They are collected and submitted to further evaluation through the program and through the users themselves. The major cognitive process on which the project focuses at this time is association. The difficulty in dealing with these processes is that they constitute an open system. Once constituted, associations can be documented, refined, discarded if they are irrelevant, or submitted for future evaluation by the learner and by researchers. In terms of programming, associations require the involvement of fuzzy models and soft computing, and a fully supported interactive multimedia environment. (A text can be associated to sound, image, motion, etc., and combinations thereof). 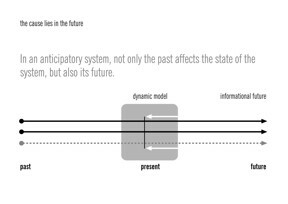 Anticipatory computation will probably better address issues of association by researching the domain of possible and not only probable connections. In the knowledge space that we define, learners can pursue a one-dimensional inquiry, the classic example being historical analysis, i.e., the gnoseological sequence. Or they can pursue a multi-dimensional inquiry, for instance, the relations between a theory in physics and the broader context of knowledge and action, including identifiers such as aesthetic value, dominant cognitive characteristics, the state of technology, etc. We are motivated in this approach by the notion that knowledge dissemination cannot and should not be reduced to retrieval mechanisms. Learning minds, i.e., people interacting in the process of learning in a digitally supported environment, are actually defined in a process of discovery. This is where anticipation comes to expression. The active component of the act of learning—the anticipation—is what we in fact pursue. Accordingly, the navigation tools developed are tools for making such interaction possible, that is, for engaging the individual or the group, not just for triggering reactions. Especially in a context of information overload, learners have to be able to prune what appears to them as the seemingly endless knowledge trees provided by digital systems. 1. KMD is based in Brighton, the United Kingdom. See www.Kindwebdesign.com. 2. Two P2P sites are www.kazaa.com and www.kephyr.com. 3. Chaplin, Charlie. Author of the movie Modern Times (1936). The story is set in 1930, the Great Depression, and points out the dehumanizing effects of machines, that is, humans reduced to machines. 4. “Terminal 2E was designed by world-renowned architect Paul Andreu, who designed the Beijing Opera House and other terminals at Charles deGaulle Airport.” The terminal was supposed to turn the airport into the hub of Europe, replacing Lodon and Frankfurt. (cf. http://www.cbc.ca, May 24, 2004). 5. For more information on the Walt Disney Concert Hall, see http://laphil.org. Numerous books and Websites deal with Frank Gehry’s design. But even this design had to be fixed: too intense sun reflections on the metal structure triggered complaints. 6. The project was carried out in the framework of the (erstwhile) Computational Design Program (University of Wuppertal). Associates involved in the project include Silke Braemer, Stefan Freisem, Oliver Helmich, Clemens Lango, Stephan Lehmann, Lutz Mü ller, Alex Rösgen, Torsten Stapelkamp, Peter Stefan. Some ideas from that work are currently pursued within the Institute for Interactive Arts and Engineering at the University of Texas at Dallas. Baecker, Ron. The Web of Knowledge Media Design. At the launching of the KMDI and Institute at the University of Toronto, January 1997. Eliot, George. Daniel Deronda.1876. Book VI, Chapter XLII. Foerster, Heinz von. Der Anfang von Himmel und erde hat keinen Namen (2nd ed.). Vienna: Döcker Verlag, 1999. Krug, Steve. Don’t Make Me Think: A Common Sense Approach to Web Usability. Indianapolis: New Riders, 2000. McLuhan, Marshall. The Medium is the Massage. New York: Bantam, 1967, p. 26. Nadin, Mihai. The Civilization of Illiteracy. Dresden: Dresden University Press, 1997. Nadin, Mihai. Jenseits der Schriftkultur. Das Zeitalter des Augenblicks. Dresden: Dresden University Press, 1999. Nadin, Mihai. A Mind at Work. (M. Vilanova and F. Chorda, Eds.). Heidelberg: Synchron Publishers, 2003. Nadin, Mihai. Anticipation – The End Is Where We Start From (English-German-French text). Baden, Switzerland: Lars Mü ller Publishers, 2003.